Extending from the Wabash Avenue bridge to the Wrigley Building breezeway, the celebrated River Walk at Trump International Hotel & Tower Chicago provides 1.2 acres of refined outdoor space and features 90,000 square feet of exclusive retail space, public relaxation areas, pristine landscaping and unparalleled views of the city. Clad in Jerusalem Gold limestone and paved with imported black granite, the River Walk creates a unique vista in the curve of the Chicago River. Perspectives from the heart of the city look south into the Loop and east across the river past Navy Pier and the Lake Michigan horizon. Passersby enjoy the history and scale of Chicago's remarkable architecture from a location that has become acclaimed as the most significant addition to the skyline in generations. The River Walk's contribution to the River North community includes a landscaped park with a serene water lily reflection pond, communal seating, a dog park, and on-site access to the Chicago Water Taxi system. 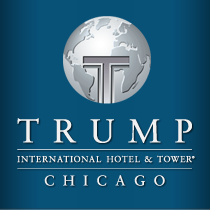 Residents of Trump International Hotel & Tower Chicago enjoy the city's most exceptional urban living with the rare luxury of exquisitely manicured outdoor space.